The EMAT (Phased Array) system is designed for a variety of applications, consisting of two portable components, front end unit and base unit. Control functions, data acquisition and data analysis are performed through the integrated PC. 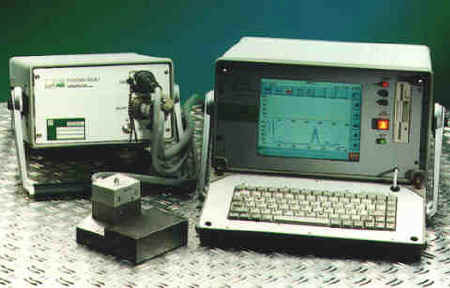 Standard and custom EMAT (Phased Array) search units are designed and manufactured by IZFP. Electronic control of the sound beam angle and shape. Generation of horizontally polarized shear wave mode (SH-wave). Generation of vertically polarized shear wave mode (standard shear wave) and Rayleigh wave mode. No acoustic coupling medium required. Eight-channel system with integrated PC and color monitor (portable). Data interface: RS 232, RS 422, Parallel Port. Connecting cables: 150 feet base unit to front-end unit; 30 feet front-end unit to search unit; Raychem multi-contact quick disconnect system. Data recording can be adapted to other systems such as P-scan, Tomoscan, ALOK, etc.